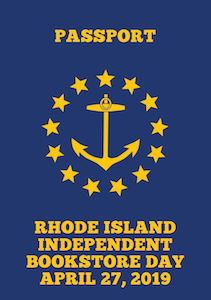 For this year’s festivities, we’re partnering with other indie bookstores in Rhode Island on a Passport Tour. To participate, simply pick up a specially designed passport at any one of the 15 participating stores (presented on this nifty map) on Saturday, April 27, and then visit 14 of the 15 stores to get your passport stamped. Grand Prize: One $25 gift certificate to each of the 15 participating bookstores (a $375 value). Drawn at random from Passport Prize winners. We’ll also have special one-day book promotions, and a special literary cocktail menu for everyone wrapping up their literary tour of Rhode Island in our relaxing bar.